….the Shaham Erez Wallfisch’s performance of Dvořák’s DumkyTrio is an utter delight – one of the best on record, in fact, which is saying a lot. Throughout, they have fun with the music and make the most of its soulfulness while always maintaining a tight rhythmic and structural grip. Listen to how they pounce on the down-beats of the first movement’s Allegro, allowing them to spring joyously from phrase to phrase. The dotted rhythms in the second dumka have an articulate expressivity that’s almost like speech, while the third deftly balances earthiness and delicacy. And in the finale, there’s light-hearted ferocity that, heard in concert, would surely bring down the house. 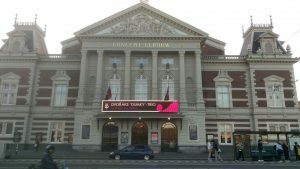 Disc of the week – details of an outstanding new release! 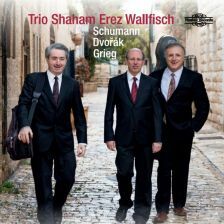 Lovely publicity for Trio Shaham Erez Wallfisch residency at Amsterdam’s perfect Concertgebouw. In advance of his concerti with the London Mozart Players, you can catch Raphael Wallfisch next Monday on BBC Radio 3 In Tune talking about this concert and also his new, soon to be released, disc of the music of exiled Jewish composers. 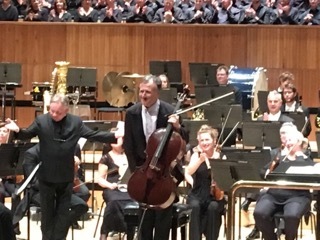 Raphael Wallfisch photographed, to rapturous applause, at the end of his performance of the Elgar Cello Concerto with the Philharmonia Orchestra conducted by David Hill at London’s Royal Festival Hall. Raphael Wallfisch and the Berlin Konzerthaus Orchestra, conducted by Nicholas Milton have been busy recording Karl Weigl’s Cello Concerto. The work, despite its composition in 1934, has never been performed. 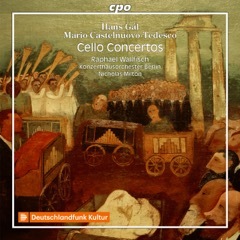 Wallfisch’s performance will appear in a series of recordings with Classic Produktion Osnabrück (CPO) of cello music by Jewish composers who lost their voices in exile. Many of the composers to be included in the series — Weigl, Hans Gál, Mario Castelnuovo-Tedesco, Berthold Goldschmidt, Franz Reizenstein, Robert Starer, and Ernest Bloch — had a connection either to Wallfisch’s parents, who were exiles themselves, or to his teacher Gregor Piatigorsky. Chamber music at its finest!